Does Doors Open Ontario only occur on one weekend every year? No, there are dozens of Doors Open Ontario events to attend each year throughout the province – starting in April and running until October. Some events run for a single day, while others run for an entire weekend. You can choose which communities interest you and plan your weekend getaways accordingly. Spend a spring weekend in Ottawa, or enjoy a fall getaway in St. Thomas. Wherever you go, there’s a Doors Open Ontario event waiting for you! How does Doors Open Ontario work? Each event is organized by a local committee, which is responsible for selecting the sites that will participate in their event and the date(s) when they will host their weekend. Doors Open Ontario is a partnership between local communities and the Ontario Heritage Trust as a provincewide festival to celebrate cultural heritage. How much is admission to Doors Open sites? Access to a building during the Doors Open event is free of charge. The basic premise of this program is to invite people to visit sites of interest that are not normally open to the public – for free. There may be value-added tours or on-site gift shops that will cost extra. What's the best way to plan our Doors Open visit? The first thing to do is to narrow down which event(s) you want to attend. Once you’ve determined where you would like to go, review all of the sites listed on the Doors Open Ontario website that are open during your outing. Occasionally, additional site listings are available on locally hosted websites, so be sure to follow links on each event page for those websites. Don’t try to take in too much. Visiting five or six buildings or sites per day may be all you can accomplish. Talk to the knowledgeable volunteers at each site about the most interesting attribute, and don’t miss those highlights. Explore the building’s history and its architecture to get a truly meaningful experience. I own a heritage building. How do I get involved in Doors Open Ontario? First, check the Doors Open Ontario website to see if your community is participating in this year’s Doors Open program. If they are, contact the local organizer of the event to inquire about getting involved. Each Doors Open Ontario event page has contact information so you can open a dialogue with the event organizers. While Doors Open Ontario is run by the Ontario Heritage Trust as a provincewide initiative, each community event is locally run. The Trust does not select the participating sites – that’s all done at the local level. So, establishing contact with the local organizers is your important first step. I would love to see our community participate in this program. 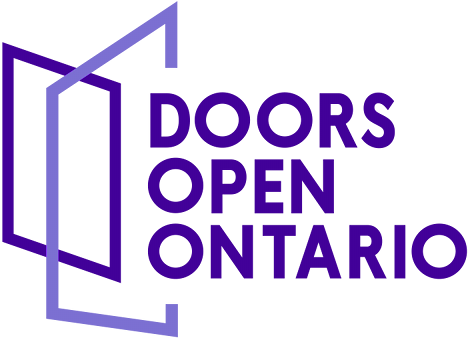 How can we get involved in Doors Open Ontario? Who supports Doors Open Ontario? At the local event level, municipalities, community groups and private sponsors support their own programs, and provide the resources necessary to organize the event, open buildings in their communities and publicize their Doors Open activities. Provincially, the Ontario Heritage Trust seeks sponsorships and grants, raises funds through registration fees charged to participating events, and self-funds any additional costs.